Reach your full potential as a performer & master any stage you’re on! The first book to approach your music career entirely from a live show perspective — 2 books in 1. 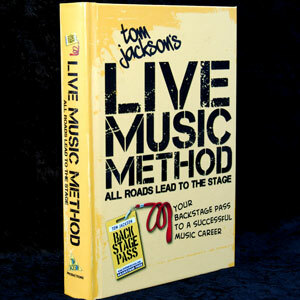 Tom Jackson's music career-changing book, high-quality hard cover. 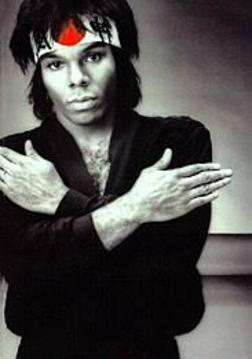 Tom Jackson's music career-changing book, formatted for Kindle readers, apps, and devices. Tom Jackson's music career-changing book, formatted for iBook, Nook, and other .epub type readers, apps, and devices. Being onstage is the culmination of your entire investment of time, energy, creativity & money. This book will help you make the most of it! 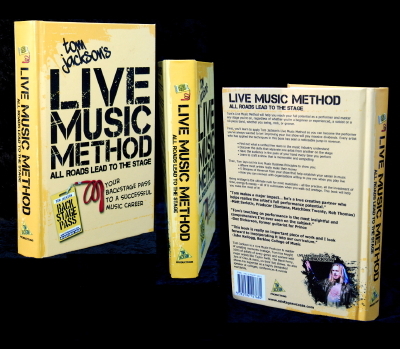 If you already own Tom’s DVDs, you’ll love the additional material this book covers! Additional graphs for longer and shorter sets, how (and when!) to speak to your audience, Tom’s method of getting a vision for each song and how to uncover the moments during rehearsal, a time-proven business model that will increase your income and build a strong fan base, and much, much more! Tom Jackson helps artists at every level create an engaging & memorable live show, exceeding audiences’ expectations, creating fans for life. 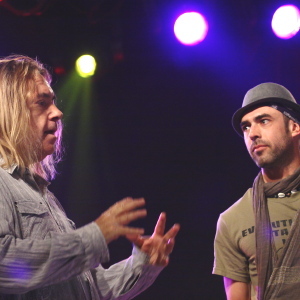 He’s taught 100’s of artists of every genre & worked with major artists like Taylor Swift, The Band Perry, Magic!, & more. Which download format should you choose? To read your eBook on a Kindle, Kindle Fire, or with the Kindle app, get the .mobi file. To read it on almost any other device, get the .epub file. Connect the NOOK to your computer and access it in Finder (Mac) or Windows Explorer (PC). Locate the folder: My Nook > My Files > Books. Drag and drop the .epub file to that folder. Search your NOOK Library for the eBook’s title. Tap on the eBook’s page. A pop up menu will appear. Click the text button. Switch on the Publisher Defaults. Connect your Kindle device to your computer. The Kindle will load as a storage device called “kindle” on the Desktop (Mac) or My Computer (PC). Open the folder called “documents” located inside the “kindle” storage device. Drag and drop the .mobi file to the “documents” folder on your Kindle. Install the Kindle for IOS app on your device. Open the download email on your device. Click the .mobi download link. You will be redirected to Safari. Be sure the iBooks app is installed on your device. Download the epub file from your email. Double click the .epub file icon you just downloaded. You will be redirected to Safari, or your iBooks app will open. In order to read an eBook file on your computer, you must have a reading app installed. We recommend Adobe Digital Editions*, available for quick and free download. Download Adobe Digital Editions for free. Download the .epub eBook file to your computer. Double click the file to open in Adobe Digital Editions. Can you share your eBook file? When you purchase this eBook, your copy is designed for your own personal use only. While you can copy the eBook file for use on another device you own, you cannot share copies with other people. You also cannot sell your copy as a “used” eBook; ownership is yours only, and cannot be transferred. Our eBook is sold with the understanding that you may easily copy it onto up to six devices of your own. You cannot share these eBooks with other people, however.